I've been using Office 2016 for Mac as my everyday office productivity suite since it went into beta earlier this year, and I don't understand why so many reviewers are fawning over it. It's a marginal improvement over Office 2008, and it has issues that show it should still be in beta. Maybe because it's been four years since Microsoft bothered to update Office for Mac (the stunningly unusable Ofice 2011, whose painful memory I long ago buried), and seven years since a serious update (Office 2008), people are grateful of anything. But I think we deserve better. The good news is that the core of Office 2016 is solid -- as it was in Office 2008 and Office 2003 before it. Frankly, Office is a very mature product that doesn't need more features thrown at it, simply refinements and support for modern trends like cloud storage access. But as Microsoft typically does on its Mac software, it cuts corners and sacrifices usability where it doesn't need to. Here are examples of that unfinished quality in Office 2016. When you open the app, there's a new file-browser window that takes you through an extra step to open files stored locally on your Mac or on cloud storage services other than Microsoft's own. It's annoying and unnecessary. Fortunately, once you create a new document or open an existing one, you can access the standard OS X Open dialog boxes using the menu bar (not the Open button above the Office ribbon). But why add that extra step at each app launch? And why is it so slow to open the standard OS X Open dialog box once you click On My Mac? And why can't the Mac office file browser directly access Dropbox, like the iOS and Android versions can? It doesn't make sense to offer that ability on some platforms but not all. 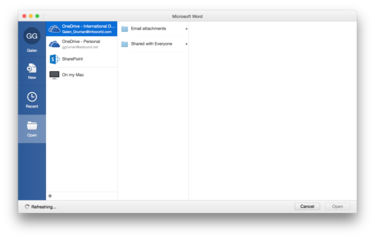 The file browser in Office 2016 for Mac forces users to take an extra, slow step to access local files as well as files stored in cloud services like iCloud Drive, Google Drive, Box, and Dropbox. Also, if Microsoft is going to force a file-browser window on users, it should at least allow multiple selection of the files it presents, so you can open multiple documents simultaneously -- as the standard OS X and Windows Open dialog boxes do. Furthermore, that Online Options button Microsoft sticks into the standard OS X Open dialog box is misleading: It simply opens the Office file browser, whose only online (cloud) options are OneDrive, OneDrive for Business, and SharePoint. That's naughty. Wait, there's more! OneDrive for Business doesn't work on the Mac. The app has been in public beta since January (the production version is due by 2016) and has never worked reliably. It has crashed on startup for months and sometimes again later, for no obvious cause. In the last week, it has stopped working altogether. Maybe that means Microsoft is merging OneDrive for Business into the OneDrive app, as it did on iOS and Android earlier this year. If so, that merger hasn't happened yet, so any corporate Mac user can't access files on OneDrive for Business from Office. I suspect this is more about bad software, as many users running various versions of OS X have been reporting frequent OneDrive for Business crashes for months. It's one of the least reliable pubic betas I've ever been a part of. The OneDrive for Business option in the Office apps' file-browser window doesn't work right, either. I can see the two top levels of folders, but no files in them or folders below those two levels. However, they work perfectly fine on my iPad from both the OneDrive app and Office for iPad. Thus, the Mac implementation is flawed, not the back-end service. I'm sure one day this OneDrive nonsense will all be worked out, but why isn't an operational workaround in place in the meantime? I believe it's part of Microsoft's "Mac last and least" strategy. Both the beta and production versions of Office 2016 for Mac crash fairly frequently in my usage. It mainly occurs when I'm editing files in Dropbox, the service I use to keep project files accessible across my devices and operating systems. It's as if a network or access interruption freaks out Office, and it crashes. Office 2008 doesn't have that issue, so I suspect it's related to Office 2016's nonstandard file-access mechanism. In my experience, the only other apps that show this same behavior are those in Adobe's Creative Suite, which also has a nonstandard file-access mechanism. For the record, I can't tell if this is an issue specifically with Dropbox or with any cloud service; I don't use my personal iCloud Drive for the same length of time or frequency to compare crash patterns in Office for that service. Ditto for other cloud services; my usage is too occasional to get an accurate read. Perhaps related is a frustrating behavior in Excel (since most spreadsheets I work on are in the cloud). Periodically, the spreadsheet stops responding to data entry and mouse movements: I can't enter data, move from one cell to another, copy, paste, or pretty much anything else in the sheet itself. I have to save the file before it becomes responsive. I'm a frequent saver, so it's not like I have tons of stuff in memory that is overwhelming Excel. Plus, this doesn't happen in earlier versions of Excel. For a company claiming to be cloud-first, Office 2016 is a poor standard-bearer. I've remapped the Command-F shortcut in Word from Edit > Find to the much more useful Edit > Replace, but when I relaunch Word it reverts to Edit > Find, though I've saved the keyboard preference in normal.dotm. Worse, when I look at the Customize Keyboard dialog box, it shows that Command-F is assigned to Edit > Replace. But Word doesn't honor that setting. I dislike the Office ribbon intensely, as it is both cryptic and hard to use. Fortunately, you can use the standard Mac menu bar and ignore the ribbon bar. But you must use the Styles pane, which wastes a lot of onscreen real estate (especially when working with documents side by side, even on a 27-inch monitor), yet does nothing to improve access to styles and other formatting. For the record, I'm not a fan of Apple's style drawer in iWork, either. How I wish I could get the Office 2003 style formatting bars back in Office 2016: It's both easier to use and much more space-efficient.